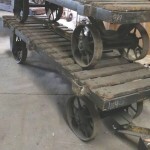 Now here is a real factory cart. FOB Canton OH. Got a 100 or more if you are interested. Antique dealers sell these as is for $400 or 500 and if they clean them up a bit they go for $1,000.